Matt Kindt (creator of Super Spy, Revolver, and more) recently ran a Kickstarter for an audio comic — on a vinyl record! — set in the MIND MGMT universe. He talks to Tim in this episode about how it went, why he wanted to do this project, and what’s coming next from him. 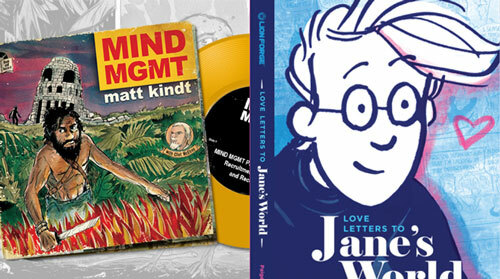 Then, Jason McNamara joins Tim to discuss Love Letters to ‘Jane’s World’, a 20th-anniversary collection of Paige Braddock‘s Eisner-nominated strip. It’s becoming a yearly tradition during Chicago’s C2E2 convention that I get to talk with Valiant’s excellent creators. This year was no exception, and Episode 279 kicks off with my interview with Dinesh Shamdasani, Valiant’s CEO and Chief Creative Officer. We delve into all the fascinating happenings with X-0 Manowar, Harbingers and the upcoming digital presentation Ninjak Versus the Valiant Universe, among other things! Then everything wraps up with my talk with Daniel Kibblesmith, who’s scripting the upcoming return of Quantum and Woody. He’s also writing the Valiant Digital Firsts miniseries Valiant High now available on Comixology, so we discuss both projects as well as a certain night job he has writing comedy for a well-known late-night TV show you might recognize! Don’t miss these fun conversations! Once again, Derek visits his local shop, Valhalla Games and Comics in Plano, TX, to talk with customers and employees about the various titles they’ve been reading. And he has a large number of people joining him for this month’s on-location episode, including the owner of Valhalla, Dave Larson. Derek begins the episode by talking with Dave about the changes he’s bringing to the shop and his experiences in gaming retail. But others join in on the discussion soon enough, including the shop manager, Sabrina, one of her associates, Stephanie, and several of Valhalla’s regulars, Craig, Matt, and Chris. This month, the topic is open-ended, so the conversation freely flows from one subject matter to another. Along the way they cover the DC’s new Young Animal series, the changes wrought by Rebirth, the current state of various Marvel titles, the growing number of superhero-based films and TV shows, the narrative worlds of Matt Kindt and Jeff Lemire, and, for at least one of the interlocutors, the discovery that Lucifer is actually a comic-book series. This episode, let’s look ahead to a new book coming out on March 25 from Dark Horse called PastAways! I interview the book’s creators Matt Kindt (from MindMGMT) and Scott Kolins (from The Flash) as we prepare for its upcoming launch! They give us a lot of information about what I like to call an “adventure” comic, including how the concept and title of the series came to be as well as dishing on the characters and some great sci-fi concepts we’ll find there. Both will update us on other projects they’re working on as well, so don’t miss it! Be back next week for another great interview with another excellent comics professional! The crew returns to discuss four new comics, headlines and more. Things get kicked off with some banter and some headlines, ranging from comics, to film to cereal! Then we have a brand new Facebook Shout-Out. For Topic Time, we discuss four new titles, with Star Wars: Rebel Heist #4, Terminal Hero #1, Deep Gravity #1, and Grimm Fairy Tales #101. The crew returns to to talk news, news, and more news! This week, it’s Brant, John, Chris & Mike Ventura. We discuss several headlines, including Graphicly closing, the New 52 Helena Bertinelli, Edgar Wright leaving Ant-Man and much more. For Topic Time, we talk about Star Wars: Rebel Heist #2, Doctor Spektor: Master of the Occult #1, and Trees #1.